Another good tip for going out with the family.... with a family of 6 we try to dress all in the same color when we are on vacation. It is so much easier to keep track of everyone. So everyday we are there, I make sure I pack similar colors for each family member. If you want to get real creative, which I tend to do often LOL, I make shirts for each of us. For example, Daddy, Mommy, Big Brother, Big Sister, Little Sister and Littlest Sister. That is always fun too. That's a clever idea. 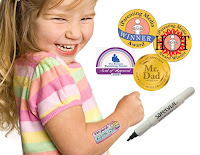 My kids think that temporary tattoos are so much fun anyway, that these would be a simple solution! Thanks! Neat idea! 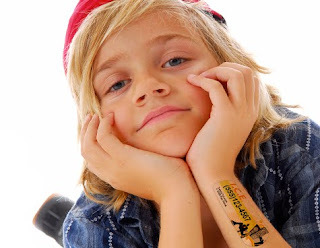 We live just a short drive from West Edmonton Mall and are there about once a month, I just write my cell # on their arm, just in case they get lost, they at least can go into a store and call me. I am going to look at their website right now and see if they ship to Canada. Thanks!! You have a terrific blog! I'm a new follower from Friday Follow. Nice to meet ya'!